I first tasted Knapp wines back in the late 1990s. They were known for a number for different things, an were considered a solid winery with a good reputation. As is so common in the wine world, I have been distracted by a slew of new wineries and younger winemakers. In dating parlance, it wasn't Knapp, it was me. No, really! So, while on a recent trip to the Finger Lakes I decided to stop in at Knapp. I had not done so in many years. It was good to be back. Knapp was one of the first wineries I tried when I first started visiting wineries in the late 1980s. Knapp Winery, in Seneca Falls the winery was founded in 1984. In the year 2000, the winery was sold to current owners Gene Pierce and Scott Welliver. Knapp had an historical claim to fame - it was the first winery in the Finger Lakes Appellation to plant and vinify the grape variety Cabernet Franc. As one of the owners of Glenora Wine Cellars (the first winery on Seneca Lake) and one of the pioneers of the Finger Lakes grape growing region, Gene Pierce oversees the Knapp estate which encompasses sixty-five acres of land of which forty acres are currently cultivated for growing estate Riesling, Cabernet Franc, Chardonnay, Lemberger, Sangiovese, Merlot, Baco Noir, Cayuga, Catawba, Seyval, Vignoles and DeChaunac. He is involved in all aspects of the farm and production facilities. Gene is among the most important personalities in the Finger Lakes, and an incredibly accomplished man. Knapp Winery has a new winemaker, Rachel Hadley. Rachel didn't make all the wines I tried, but he certainly had a hand in guiding them to the bottle. I thought the final product was polished and spiffy. Very professional looking wines. I mean that in the nicest and most complimentary way! It is a compliment! The Knapp Dry Vignoles 2016 was among my favorite wines of the tasting, and the very first I tried. Aromatic, with great flavor and great acidity, this was an exceptional dry white right up there with Gewurztraminer and Vigionier. An exceptional value as well. Very delicate and fruity, but elegant. While I was there to try the quality dry wines, Knapp also produces a line of inexpensively priced popular sweet fruit infused wines for picnics and sipping. With a different and very colorful series of labels, this is very very successful line. But don't let this dissuade you, if you are more of a classic wine drinker, Knapp's drier and more classically styled wines are very good! The Knapp Dry Riesling 2016 with an RS of 0.80% is a super aromatic green apple bomb with hints of granny smith apples, pineapple, lychee, apricot, and other tropical fruits. A lovely wine with a nice, nice citrus ending. Big, beautiful nose. Very pretty. The Knapp Pinot Noir 2015 is a wine glass full of bright Bing cherries, on the nose as well as on the palate! This bone dry red has lovely notes of strawberries and plums as well as a slight hint of vanilla. But the fruit comes through beautifully! The Knapp Lemberger 2016 is a dark cherry revelation, with lovely tart fruit, balanced by nice tannins and terrific acidity. This was a shocker. My second favorite dry wine of the tasting. Not a huge fan of Lemberger, but this was an incredibly gorgeous wine. The Knapp Meritage 2014 is made from 33% Cabernet Sauvignon, 34% Cabernet Franc, and 33% Merlot. It was aged in new American oak. A classic vinifera laden meritage wine. This wine had big dark cherry and dark raspberry up front on the nose and tongue. Notes of eucalyptus, sweet fruit, and vanilla and spice. You could drink this now, or cellar it for at least five years. A very layered, and complex wine. Very, very impressive. Knapp Mb Muscat Bubbles is a carbonated wine made with muscat. I love muscat. And this semi-sweet bubbling varietal wine of this grape is spellbinding. Its a simple enough premise - it's Finger Lakes prosecco. Slightly sweet, with lots of nose and acidity, it's got a ton of fruit up front, great acidity as all sparkling wines should, and tremendous body. Meant to be a fun, fun sparkler - and it succeeds. Fantastic. Another of among my favorites of the tasting. Thistle Creek Hard Cider is made at Glenora Winery, Gene's other winery. According to their website: " The apples are picked and pressed at Red Jacket Orchards in Geneva. Upon arrival to Glenora, the juice is clarified to retain fruit flavor and then yeast is added. The juice ferments until it reaches 5% alcohol and is then chilled to stop fermentation. From there, the hard cider is filtered and put into a specialized tank that can hold pressure, which is needed for the addition of CO2. CO2 is added via a special carbonation “stone,” which diffuses the CO2 into very tiny bubbles. This process takes about 3 days. From there, the hard cider is bottled with a special filler that retains the CO2, then labeled. The entire process from pressing to bottle takes 3-4 weeks." Tart – Ida Red, Northern Spy. That said, this is a lovely, bright, crisp and refreshing A very, very well made cider, with a terrific nose, and a great mouthfeel. An easy, easy sipper! I had not been back to Knapp Winery in a long time. And I will put that on me. I got distracted by a number of new shiny pennies. Gene and Rachel are upping the game at Knapp. Very exciting times ahead. But Knapp is making some lovely wine. Check 'em out! I first tried Big Barn Red back in the fall of 2009 on a trip up to Vermont to see my brother-in-law Robin Hoover in Stowe. Recently, (ah hmmm) I tried their wines at the Taste Camp Vermont. So this post is a tad late.....apologies. The winery is owned by David and Linda Boyden. "Located in a restored 1875 carriage barn on our family farm, the Boyden Valley Winery is steeped in the culture and agricultural heritage of Vermont’s Green Mountains. From 8000 grapevines and 100 acres of maple trees, lovingly tended by our family for four generations, we craft wines that feature only the finest locally grown fruit from the loamy soils of the Lamoille River Valley. The care with which we’ve nurtured the Boyden Farm for 100 years lends itself to traditional winemaking techniques, producing wines clean to the palate and balanced." Since my first encounter with them, Boyden Valley Winery has grown.They now have two locations! Their original location, and their new Tasting Annex in Waterbury situated at the famous Cold Hollow Cider Mill on Route 100. The original and charming tasting room in Cambridge at the winery of course remains open.David and Linda remain fixtures of course, but the staff has grown. Bridget Jones in the General Manager, Nick Roy is the winemaker, JT Bachman is the assistant manager, and Tom Lyga runs the new annex for the winery. The first wine I tried was the Boyden Valley Winery Cowtipper White Wine. The wine is made from the grape LaCrescent. It was a lovely wine, bright and fruity, like a semi-sweet Riesling, with lots of green apple and hints of grapefruit, apricot and even hints of pear and honeysuckle. Delicious! Let me say again, 8 years later, Big Barn Red is as impressive a wine now as it was then. And that's saying something, because the industry in Vermont has grown up around them significantly, and this wine has kept pace. Boyden Family Big Barn Red is made using estate grown Frontenac blended with and regional Cabernet Savignon. This is meant to be a big, Bordeaux styled red, and it delivers. Gargantuan notes of dark back cassis and black raspberries converge with dark cherry, smoke, and cocoa. A lovely, love;y big red. Calls for something grilled, charred, or roasted! Or something big like a Penne Arrabiata. Wonderful! Boyden Valley Vineyards is an amazing place that is certainly more than just keeping up with the burgeoning Vermont craft beverage scene - it's helping to lead it! Go and check it out! In 2011 Garry and Micki Cohen got serious about wine. They planted a small vineyard on their property in Middletown, Maryland; in the south western part of Frederick County. The original 1/4-acre test vineyard was planted in April 2012. The vineyard has been expanded every year since and is currently 1.75 acres. The Cohen's mission is to grow the finest wine grapes in the Catoctin American Viticultural Area or AVA. This AVA is geographically defined from the north by the Mason Dixon line, from the east by Braddock Mountain, from the south by the Potomac River and from the west by South Mountain. They started off with Vidal Blanc, but they have also planted Albarino, Cabernet Franc, Cabernet Sauvignon, and Tannat. Their ultimate goal is to make high quality quality wine. And in this first varietal wine they have produced they have absolutely succeeded. I met Garry Cohen at the Taste Camp Maryland in May 2017. It was clear from the beginning he wants to make high quality wine of integrity. The Mazzaroth Vineyards Vidal Blanc 2016 was an elegant white with hints of pineapple and citrus. This was a delicate, light, delicious wine, that you might have otherwise thought came from California or France. Absolutely lovely. An impressive wine. Really looking forward to what the Cohens will produce and release in the future. I first had Stowe cider when I bought it at the general store in Woodstock, VT while visiting the Woodstock Inn with family a while back. Then two years ago I went to taste camp and tasted some of their newest ciders, and I can't lie, my brother-in-law Robin Hoover also brought me several small caches of it during his visits coming down from the Green Mountains. As has my friend Todd Trzaskos also from Vermont. So I have been well stocked, and well supplied. In an article from Stowe Today, in May 2017, "Stowe Cider is looking to move its production to a new facility, according to a report in Stowe Today. The move to the new 4,000-square-foot location will enable the cidery to quadruple its production. Construction is planned for this summer if state permits are approved. Local permits have already been secured. The owners anticipate that all permissions needed will be in hand by June.The new location will be used primarily for production. Stowe Cider’s tasting room in the Red Barn shops will remain open." The article went on to say, "To iron out wrinkles in the water and sewer situation on Town Farm Lane, town officials have been working with Stowe Cider owners, as well as Chris Curtis of West Branch Gallery, who owns the building Stowe Cider will rent, and Howard Smith and Nate Freund of Sushi Yoshi." Stowe Cider is among my favorite New England cider producers Though there are many I like I freely admit. But Stowe is good stuff! Tips Up is their semi-sweet cider, with a lovely crispness that's hard to beat. This is the easy quaffer! High & Dry is almost like drinking sparkling wine, The apple comes across green and delicious and tart, but the there's no sweetness at the end, Just a lingering of sour apple. A great food cider! Safety Meeting is my beer cider here. Dry hopped, ti has a beautiful floral nose, with a dry finish and a great hop flavor, almost like an apple tinged light lager. Refreshing and awesome! The Stowe Rum Ginger Hard Cider Smuggler's Reserve was easily the favorite of he whole tasting!!!! This is a ginger infused cider, that was aged in a rum barrel. A big pop of green apple with lots of spice and pepper, mixed with the delicious aged rum touch. Damn, this is as high end as cider gets. Loved it! One of my all time favorite high end craft ciders. This is where cider goes from craft beverage to craftsmanship and artisanal. The Bourbon Hard Cider Barrel Aged Smuggler's Reserve is a cider aged in a bourbon barrel. A big, brown sugar and apple bomb with a little gingersnap to it. Very very nice. Impressive! You may not have the friend and relatives I do, but you need to get your hands on this stuff asap anyway! Make the effort, it's worth it! 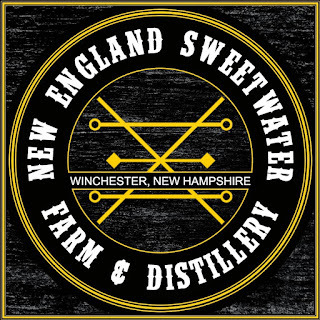 New England Sweetwater Farm & Distillery was established by Robert Spruill and his wife Patti, and his brother Joshua Spruill in Winchester, NH. They are in the South West corner of New Hampshire’s Monadnock region. The farm is nestled on 50+ acres near the slopes of Mt Pisgah. 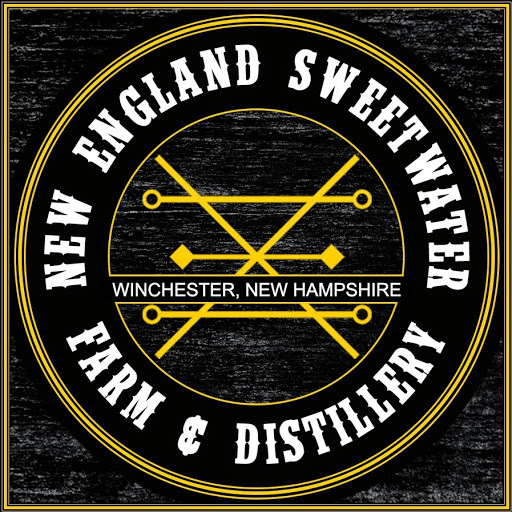 It is a family run operation, both farm and distillery, and according to them, is conveniently located within a 200 mile radius of Portland ME, Manchester NH, Boston MA, Providence RI, Hartford CT, and New York City. 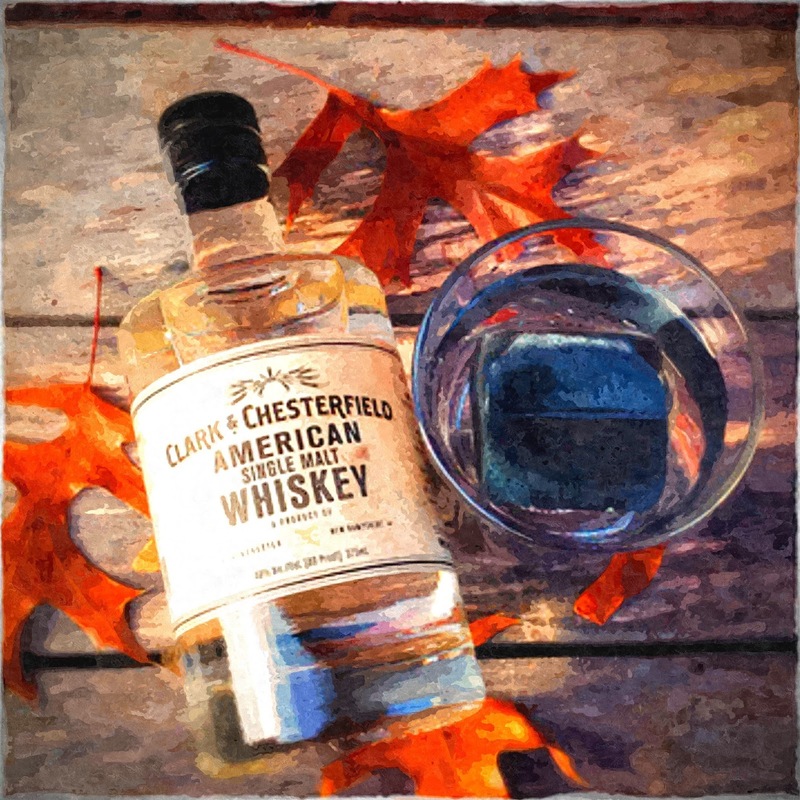 Clark & Chesterfield Bourbon Whiskey is distilled from 51% Raw Yellow corn, over 30% Rye, and the remainder is Malted Barley. This high Rye Mash is aged in full size New American Oak barrels. This small batch Bourbon was bottled at 107 proof for their 1 year anniversary. This is a big bourbon, with loads of caramel, brown sugar, and a big wallop of black and white pepper and gingersnap. It can stand up to ice, can be enjoyed straight, or used in your favorite bourbon cocktail. Loved it! 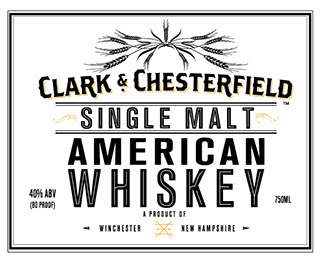 These two whiskies can be purchased at the distillery or the New Hampshire state store in limited quantity. Great stuff! Get some! Yankee Folly Cidery was established in April 2014 formed by Edmund Tomaselli and Eric James in New York's Hudson Valley. The hard cider is produced using apples from the Jenkins & Lueken orchards on Yankee Folly Road in New Paltz. According to the website, "It started over 50 years ago with Eric’s grandfather Jack Lueken, his partner Raymond Jenkins, and just a few trees and five varieties. They soon became a local favorite. The orchard was family-owned and family-operated then, and is now." Today, the Orchard has expanded to thousands of trees and over 40 apple varieties. Of these varieties is the distinctive and highly acclaimed Golden Russet that Jack Lueken himself brought over from Germany. The Hudson Valley is home to numerous cideries. And this is an excellent addition! The cider is more like a off-dry Riesling, with lots of green apple and red apple, with hints of lychee and melon. A very, very impressive light cider! Despite it's more popular branding, it's actually a damn good light cider! Drink up! 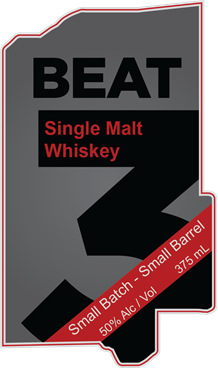 Beat Single Malt Whiskey 50% ABV (100 proof) is a small batch, small barrel whiskey made by Djinn Spirits. Djinn Spirits (pronounced "gin" spirits) is a craft distillery located in Nashua, New Hampshire. It was established in December of 2013 by Andy and Cindy Harthcock. Djinn was an instant hit with their gin, and followed up with a series of white and aged whiskies. Andy and Cindy were thrilled to release the first single malt whiskey in the state’s history. Micro-batch fermentation, double distilled, and aged in small 15-gallon high-char oak barrels resulted a very smooth, spicy new spirit. The first bottling was very small, and available only at the distillery tasting room. But it can now be found on the shelves of small stores and of course, the New Hampshire state store! A fantastic whiskey with lots of cognac and orange rind notes, molasses, caramel, and oatmeal. I have been writing about Heritage Vineyards for some time now. Since 2010. Event wrote a feature about them for Edible Jersey magazine. And every time I taste them again, the wines just keep getting better. Two recent tastings confirmed this for me. In May, Paul Vigna gathered winemakers and media types to Pennsylvania for a tasting of some of the Mid-Atlantic's best wineries. The results were impressive. Amng the dignitaries was Dave McIntyre, of the Washington Post, who wrote, "Gather winemakers from 12 wineries in five states along with a few wine writers to taste through two dozen wines and — well, it’s not exactly a party. But I can say that it’s a lot of fun, and it’s educational. Among the first wines we had were Bill Heritage's sparkling wine. As McIntyre wrote: "The first was a 2014 brut made in the champagne method from chardonnay and pinot noir from Heritage Vineyards in New Jersey. Winemaker Sean Comninos explained that he wanted to make dry chardonnay and pinot noir, but the grapes weren’t ripening. So he decided to make bubbly, which uses grapes picked considerably earlier and less ripe than dry table wines. The result was fantastic." Yes, it was. The sparkling wine was superb. I got apples, pears, pineapple, with a big dose of bread and dough, and a lovely, creamy finish! But almost more notable was the new look! With the giant WH emblazoned on the label, there was suddenly a sea change going on at Heritage. This new wine signaled another new benchmark for one of the mid-Atlantic's rising wine stars. When recently queried about it it seems another winery has already trademarked the word "Heritage." Despite being Bill's surname, that's not good enough in the world of trade marks (just ask Walter S. Taylor of Taylor Wines/Bully Hill fame). So,over the last 18-24 months Heritage has slowly been fazing out it's older labels, and releasing wines with a new look. This sparkling wine was the first to bear he new design this past May. Since then, especially with their late summer and fall releases, William Heritage (their new brand statement) is slowly moving toward creating a higher and better brand and product (if that was possible). It actually works out well for them. According to Tina Morey, Owner-operator Certified Sommelier at Winestudio, "Heritage, obviously, is their last name but they couldn't trademark heritage because it's a used word. So, over the last 3 years they've begun trademarking William Heritage which makes sense because they are 7 generations of William Heritage." We also tasted the Heritage Cabernet Franc Norman's Vineyard 2013 Outer Coastal Plain Limited Edition. Cabernet Franc, in the wrong hands, can be a deadly affair. But not so at William Heritage Vineyards. This was a big, dark cherry bomb of a wine, with hints of mocha and cedar and pekoe tea, and small doses of cranberry and vanilla. An amazing beautiful dry red wine fit for any table, good enough to shine in any region! (above is an example of the old labels). The scene waiting for its stars off stage. Wine writers Dave McIntyre of the Washington Post and David Falcheck of Pennsylvania. No matter what! Tray a William Heritage wine. They are amazing, and you will no be dissappointed! There is no one more excited about great wine than Ethan Joseph, head winemaker at Shelburne Vineyards. Just ask him about his Marquette(s). 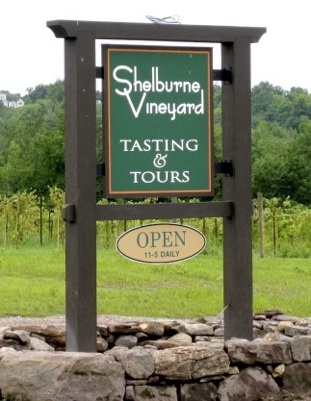 Ken Albert, Sam Coppola, and Scott Prom are all partners in Shelburne Vineyards. They have an absolute passion to make great red wines, not just good for their region, but wines that compete with any region in the world. While Vermont might still be a few players away from a championship, as we like to say in sports, it certainly seems that have many of the key parts to make a very good run at the gold. For Shelburne, it starts with the head winemaker, Ethan Joseph! I have visited Shelburne Vineyards for many years, and their in no question, that in the last four and five years, Shelburne Vineyards has upped their game substantially. I spent time with them at Eastern Wineries Exposition as well as at Taste Camp Vermont in 2016. Shelbourne grows lots of Marquette. The place is surrounded by the grape. And good thing. Because they do a great job with it. It's fast becoming the premiere red grape in Vermont, and rightly so. Whether at Taste Camp or at EWE, there is no one more fun to hang with than Ethan. According to his winery bio, "Ethan has been growing grapes and making wine at Shelburne Vineyard since 2008. He is responsible for all aspects of production, from vineyard to glass, and appreciates this integral role in the full cycle of winegrowing. As such, he is committed to highlighting the potential of northern varietals through sound viticulture and premium winemaking. Most recently, Ethan has developed a sub-brand for SV called Iapetus, which represents wines with a strong sense of place and applies minimalism in the winery. Ethan also shares his experience and expertise as a speaker at national conferences and serves as Treasurer for the Vermont Grape and Wine Council." According to the website, "It all started 35 years ago when Ken Albert planted grapes in his backyard while working as an engineer at IBM. Inspired by the new wine industry he discovered on trips for IBM to Quebec, he leased 3 acres of land from Shelburne farms and began his commercial vineyard venture believing that viticulture and winemaking could be a success in Vermont. Scott Prom a Shelburne neighbor (still working at his “day job” as a mechanical engineer) joined as a partner early on....the first commercial vintage was released in 2000." 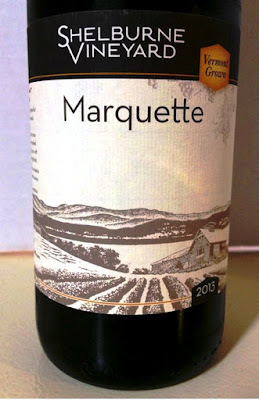 "When Ken, his wife Gail, his brother Bill, and Scott tasted the wine from the new cold-hardy Minnesotan hybrid Marquette, they made the decision to purchase the land that is now their customer friendly flagship site. Their LEED-designed winery, opened in Feb 2008 surrounded by Marquette vines now stands welcoming the public seven days a week. Sam Coppola, an attorney by profession, joined the partnership in 2013. The operation now includes of 17 acres of grapes, mostly the super hardy Minnesota hybrids, with a small planting of Riesling and Vidal Blanc." 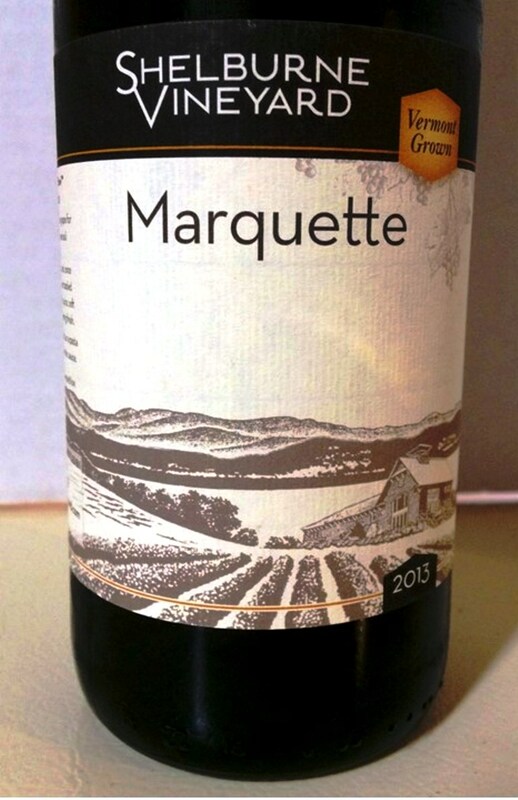 Shelburne Marquette is the classic edition of this wine. You may be familiar with their older label, but the newest edition of this classic style from Shelburne is now sold in this new packaging. I have been drinking their Marquette since they first started offering it. The 2015 vintage was aged sur-lie for 8 months in both hybrid French-American, and Hungarian oak barrels. Ethan likes Hungarian oak for Marquette. The tasting notes that the "aroma hints at ripe dark berries with undertones of vanilla and coconut. The wine is robust and rich with notes of black cherries and baking spices with a medium to full body, soft tannins and a complex, lingering finish." I couldn't agree more. I think there' also hints of cassis and cocoa. This is a beautiful wine that begs for lamb or pork or chicken. Game would be perfect, anywhere from duck to venison, to wild turkey. An amazing wine. A solid, go to wine, no matter what region you are from. The Shelburne Marquette Reserve 2013 was a revelation. This Marquette was aged sur lie — that is, on its spent yeasts and aged approximately a year and a half in oak. This dark purple wine, tinged with red, was jammy with bright and dark cherries, with a big slap of cocoa, some nice spice, vanilla, and good acidity. To me easily the best of the bunch. A classic wine that shows immense, immense promise. If not quite on par with the likes of the top growths from Bordeaux, it nonetheless, it stands proudly on its own merits. An wonderful wine deserving of attention and accolades, as well as a spot on your table, and a few slots in your cellar. Shelburne has been looking to make a statement, and no question, they have. You need to drink Shelburne!